Welcome to Our Lady of the Holy Rosary School and Parish! I am very pleased to embark on this faith filled journey with all of you this year. I arrived here at OLHR in August 2012 and look forward to growing in Christ with this blessed community of faith. Our parish is staffed by the Missionaries of St. Charles – Scalabrinians, a community of religious brothers and priests committed to the pastoral care of migrants and refugees in the world. Our school is staffed by the Sisters Servants of the Blessed Sacrament plus many lay educators. We continue to make every effort in making Our Lady of the Holy Rosary a place of commitment for Catholic faith and place where there is a deep appreciation for learning and forming young men and women of faith. We are extremely grateful to our parents, teachers, administrators and benefactors who generously contribute their resources to support our remarkable school. Join us as we strive to provide your children the education, formation and skills necessary to live good and faithful lives. The town of Sun Valley was once called Roscoe when Father Michael O’Shea from Ireland celebrated Mass for 11 families at a plumbing shop on San Fernando Road. In 1939, Archbishop John J. Cantwell dedicated the new church. From 1939 to 1974, several archdiocesan priests served as pastors, including Father Thomas Noonan, Father Augustine Murray and Monsignor Stephen Killey. For 12 years, Monsignor Robert Brennan led the parish. Father Louis Pick of the Netherlands built the new church, which has twice the capacity of the original. In 1974, the Sacred Heart Missionaries administered the parish with pastors Father Eugene O’Sullivan, Father Jerome O’Mahoney and Father Thomas Jordan. In 1993, the Scalabrinian priests were appointed to serve the parish with pastors Patrick Murray and Livio Stella. 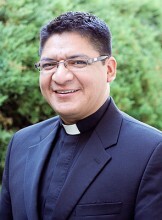 Father Richard Zanotti was named pastor in 2002. And Father Marvin Ajic became pastor in October 2012.